Sterilization in dentistry is very important, and dentists and dental assistants typically clean and disinfect most surfaces in a their offices and treatment rooms to help prevent the spread of germs. Infection control programs all include the cleaning and sterilization of reusable dentist supplies. Care must be taken by the dental healthcare professional to ensure that all instruments are cleaned prior to sterilization, and that this is carried out in a safe manner to avoid injury and puncture wounds. Since many germs can be transferred simply by touching contaminated surfaces, dentists and dental assistants are typically very fastidious about disinfecting the surfaces in their offices and treatment rooms. Solid surfaces, such as counters and sinks, are generally wiped down with antibacterial spray. Dental chairs are also usually covered with disposable paper covers that are discarded after each patient. Dentists and their assistants also usually wear protective barriers, such as gloves and face masks, to help prevent spreading germs to their patients. Tools that can't be thrown away, such as dental drills, are generally put through a very intensive dental sterilization process. First they are usually vigorously scrubbed by hand. This is usually done with hot water and detergent, and it helps remove any large particles, such as plaque. They may also be placed in a vibrating tray filled with cleaning solution, which can help remove very small particles. 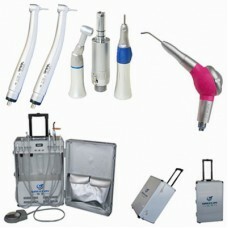 Sterilization in dentistry also involves killing the invisible germs on tools. Dental autoclaves are machines that are commonly used during sterilization in dentistry. These machines are usually made from large metal cylinders, and they are similar to pressure cookers. Once the tools are placed in the autoclave, they are sprayed with high-pressure steam. The high pressure inside this machine helps raise the steam to very high temperatures that are necessary for killing disease-causing micro-organisms. Tools that are not disposable are generally scrubbed by hand and placed in a machine known as an autoclave. This machine then disinfects the tools by spraying them with very high-pressure steam, which kills most micro-organisms. Any tools that can not be subjected to high heat or moisture are usually disinfected with chemicals. Micro organism are killed in 10 seconds by glass bead sterilizers, it prevent samples form organic elements..